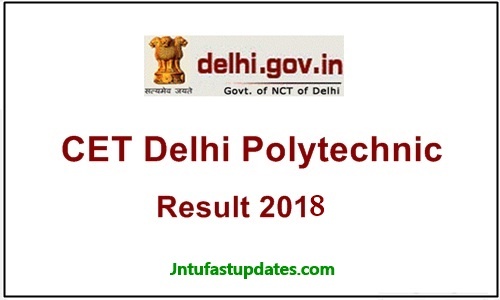 CET Delhi Results 2018 – Delhi Polytechnic Common Entrance Test (CET) Exam Results Released on 14th June. Students can check CET Delhi Polytechnic Results, Marks List, Cutoff and Score/ Rank Cards from below official websites cetdelhi.nic.in, cetdelhiexam.nic.in. Delhi Common entrance examination was conducted on may 26th and 27th. The test conducted in test 1, 2, 3, 4, 5 slots. Every people are in anxiety to check their score and get the opportunity to participate in counselling. Delhi CET Polytechnic Results Will be Announced on 14th June. Those whose Candidates appeared for the examination can check the result from Cetdelhi.nic.in. The CET (Common Entrance Test) examination was attempted by 40 thousand candidates this year. The CET 2018 examination was conducted by Integrated Institute of Technology, Dwarka on behalf of Department of Training and Technical Education (DTTE), Delhi. The CET examination is annually conducted by DTTE for admissions into Polytechnic/Diploma courses in Board of Technical Education, Delhi. The Delhi CET examination was held on 26th & 27th May across India. The CET examination was held for 5 tests. All the candidates waiting for Delhi CET examination 2018 can check their result from 14th June onwards. By providing the details of CET application number, register number or other details candidates can be able to check the results. The Board of Technical Education, Delhi is also going to release the Delhi CET cutoff marks 2018. Candidates can check the details from the official portal. As per the information, we have candidates have to obtain the minimum cutoff marks as mentioned here. Reserved category candidates: 5% of overall score. Each question carries 4 marks. There shall be a negative marking of 1 mark for each wrong answer. The admission will be given for aspirants based on the rank obtained by them. Candidates cleared the examination with minimum requisite marks will be listed in Delhi CET merit list 2018. Candidates qualified the CET examination can refer to the official portal, Cetdelhi.nic.in to check the details of counselling procedure for admission into Board of Technical Education, Delhi. The decision of result committee regarding question papers and result preparation is final. The Controller of examination, CET-2018 shall declare the rank of qualified candidates only. No separate intimation shall be sent to the candidates in this regard. All the admissions shall be made by the CET 2018 based on the merit ranking in the tests and fulfillment of minimum eligibility conditions prescribed for each test. The result of the Common Entrance Test (CET-2018) will be displayed on the website https://www.cetdelhi.nic.in on 14.06.2018 at 4.00 P.M. The candidates are advised to check the website regularly for updates. (SC/ST/OBC/PWD) must secure minimum of 5% marks in CET-2018. The candidates belonging to reserved category, who qualify on the basis of relaxation in cut off percentage, i.e., 5%, will not be eligible for admission against general category seats. DTTE is having 10 Government colleges, 5 private colleges, and 1 government aided institution working under it. In all the colleges, the number of seats were 4,635. In which 357 seats were also available for lateral entry candidates. The admission into DTTE will be given for 85% of local candidates and 15% of non-local candidates. Click on the link and enter the details of CET ID, Registration/roll number etc in necessary columns. Tap the ‘Submit’ button after filling up the details. The Delhi CET Score, result, merit list appears on screen.